I purchased (About 1 1/2 to 2 years ago) a Carter’s plush baby doll. My daughter (18 months) has decided that this is THE doll! And poor “Sally” is beginning to fall apart. 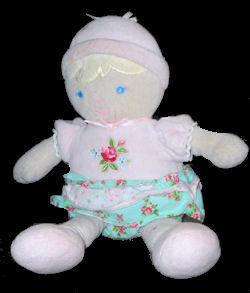 She is blue eyed, and has a pink non-detachable hat that covers yellow “hair”. Her top is pink….the bottom is a blue and pink ruffled skirt with some obnoxious flowers on it. She has white socks and pink non-detachable shoes. On her tag, it says that she is style #8779. If you are still looking hope this helps.